Out of Africa and back (to some extent) and also again out of Africa into West Eurasia where it mixed with the Eurasian component. All of which is identifiable also in more specifically human markers like Y-DNA or mtDNA. Yoshan Moodley et al., Age of the Association between Helicobacter pylori and Man. PLoS Pathogens 2012. Open access. Ethio Helix has an extensive review of the entry so I’ll be most succinct here. A new paper that researches human-hosted bacterium Helicobacter pylori may be of some interest for understanding humankind. S. Beurec et al., Evolutionary History of Helicobacter pylori Sequences Reflect Past Human Migrations in Southeast Asia. PLoS ONE 2011. Open access. H. pylori may be present in more than half of humankind but only a fraction of infected people display symptoms, which can be vague or quite nasty: stomach pain, heartburn, regurgitation, vomiting, belching, flatulence, nausea. If untreated it may degenerate into serious illnesses like gastroesophageal reflux disease, peptic ulcers or even cancer. I don’t really appreciate the pretense of the authors of using this parasite’s genome as substitute of genuine human markers nor I agree with some of their conclusions, however the data is interesting. This macro-clade would seem, I understand, the ancestral one to the region and reflects well the expectations, including the ordered divergence of hpSahul, hspAmerind, hspMaori (Austronesian-specific) and the large hspEAsia, which also shows the expected south-to-north fanning structure, found in so many other markers. Some north-to-south colonization pattern (interspersed with south-to-north bouts) is also apparent in the tree C but it is hard to understand because it is not clear how it relates with hspEAsian in tree B. It may be related to Han Chinese expansion or to Neolithic flows or a combination of the two. This is a bit more difficult to interpret but it could be original from South Asia however notice how Bengali and Malaysia Indian clades seem derived (and not ancestral) in an otherwise fully SE Asian subtree. The Ladakh clade does not help much because it is a region of largely East Asian genetics and we have already seen hpEastAsia over there (most closely related to Yunnan, surely via Tibet). This clade seems to demand better, wider sampling if we are to understand its evolutionary dynamics. This macro-clade shows two subpopulations: ‘Europe’ (including in fact West Asians) and ‘Asia’, which seems centered in India. The migration of this clade to SE Asia should be related to the Hindu (and Buddhist) influences of some 2200 years ago (otherwise it cannot be explained its presence in Thailand and Cambodia). A curiosity is the presence of a Basque strain in Philippines, which is clearly a product of Spanish colonization (in which Basques were quite active as mariners, priests and businessmen specially). It clearly shows that, under the right circumstances, no particularly important demographic flow is needed to cause an impact with this nasty bug. Bodo Linz et al., An African origin for the intimate association between humans and Helicobacter pylori. Nature, 2007. While this paper does not yet mention the Asia 2 clade, it does indicate the other relevant clades as well as their African relatives, some of which are closer, while others are more distant (b). The first split in this human parasite seems to be between Africa 2 (Southern Africa) and the rest, in agreement with what human genetics tells about our early history in Africa. Then the lineage seems to divide among a branch remaining in Africa (Africa 1 and Europe 2, aka AE2, centered in West and East Africa respectively) and another one migrating to Asia (Europe 1, centered in India, and East Asia). It seems that Helicobacter pylori also experienced an Out of Africa migration… in our stomachs. 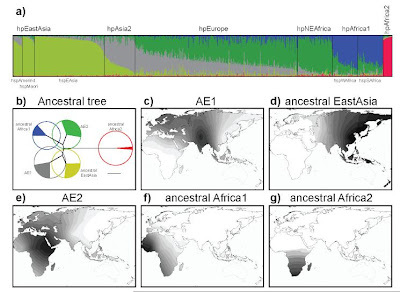 Strains of the hpEurope population were shown to be hybrids of two ancestral populations, AE1 from central Asia and AE2 from northeast Africa while modern hpEastAsia strains are almost pure descendants of ancestral EastAsia. This explanation (hat tip to Gioello) was what lead me to find this other paper by Linz et al.